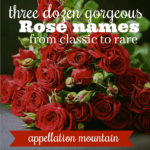 There’s no shortage of lovely Rose names. Today we’re featuring one of the rarer blooms. 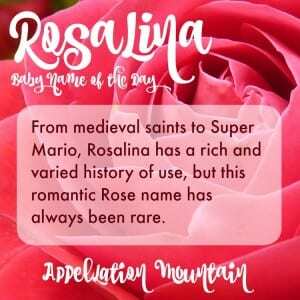 Thanks to Brittany for suggesting a find from her family tree as our Baby Name of the Day, Rosalina. There are several possible origins for this name. 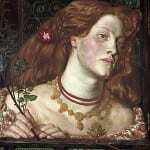 It might the Latin form of Rosaline, a form of Rosalind used by Shakespeare. The Dictionary of Medieval Names from European Sources records Rosceline and Rocelina as early as the twelfth century. Or perhaps it evolved in Italian or Spanish, where -lina and -lena are common feminine name endings. What we do know is that it isn’t terribly common over the years – but neither is unknown. Let’s start in Palermo, with a Norman noblewoman who became the saint of the Italian city. Also called Rosalia and Rusalia, the twelfth century saint lived as a hermit on a mountain outside of the city. When plague came to Palermo in the 1600s, it is said that Rosalina appeared to two different city residents, directing them where to find her bones. 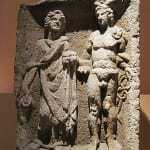 Following her instructions, the bones were found, brought into Palermo, and a procession held. Legend has it that the plague immediately left the city. Rosalina’s feast day is still celebrated every July 15th in Palermo, and a second event brings pilgrims to her mountain sanctuary in the Fall. Let’s leave Italy behind for France. Also known as Rossolina and Roseline, this second saint by the name joined a religious order in 1288 in Provence. She would eventually serve as her order’s prioress. It’s said that she had prophetic visions prior to her death. Her shrine remains a place of pilgrimage, and the Roseline Chapel contains her relics. But if the name has attracted attention in recent years, we may have Super Mario to thank. 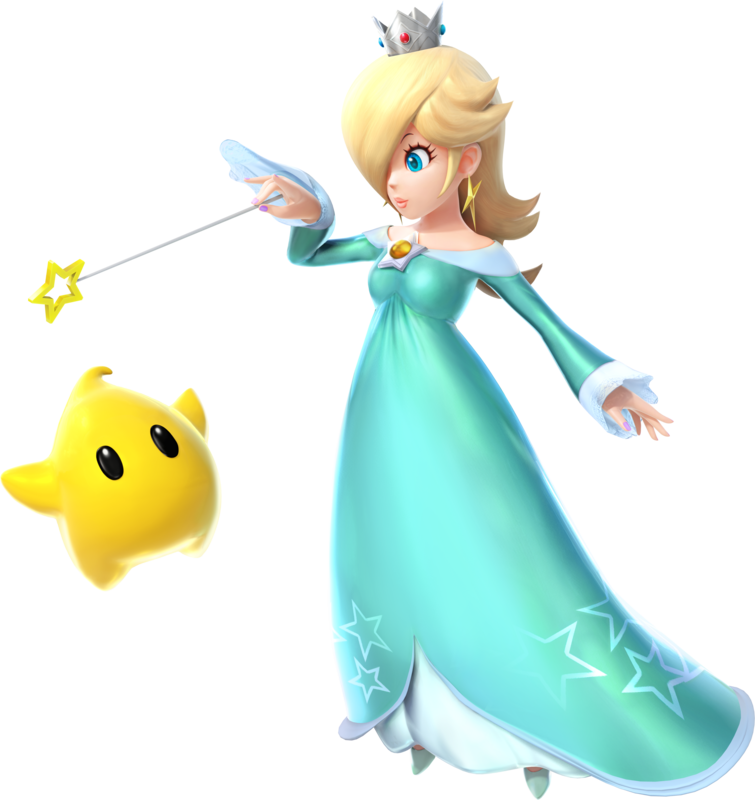 Known as Rosetta in the Japanese versions of the games, Rosalina made her debut in 2007’s Super Mario Galaxy. In her appearance, Rosalina teams up with Mario to rescue Princess Peach. In return, Mario helps her re-power her Comet Observatory by collecting stars. She’s had plenty of adventures since then, and we’ve learned more of her backstory. She’s a compassionate character – and a popular one, too. Or maybe you’ll think of The Naked Brothers Band, a mockumentary turned Nickelodeon series about a band of young rock stars. There’s a character on the show called Rosalina – and the band writes a hit song about her. You can listen to it here – it’s sweet. From the 1910s onward, a smattering of girls received the name in this exact spelling. There were 17 in 1950, 39 in 1980, 41 in 2000. Then came a bump in 2014, to a new high of 96 girls. Rosalie comes in at #310. Nature name Rosemary is #574. Rosalyn was new, at #982, in 2014. A few notable women have answered to the name – a Guatemalan human rights activist, a Filipino composer. Odds are that Rosalina simply fits in with the riot of Roses. All of the names listed above – with the exception of Rosemary – climbed between 2013 and 2014. Rosalina also fits with romance language favorites like Isabella and up-and-coming Adelina. 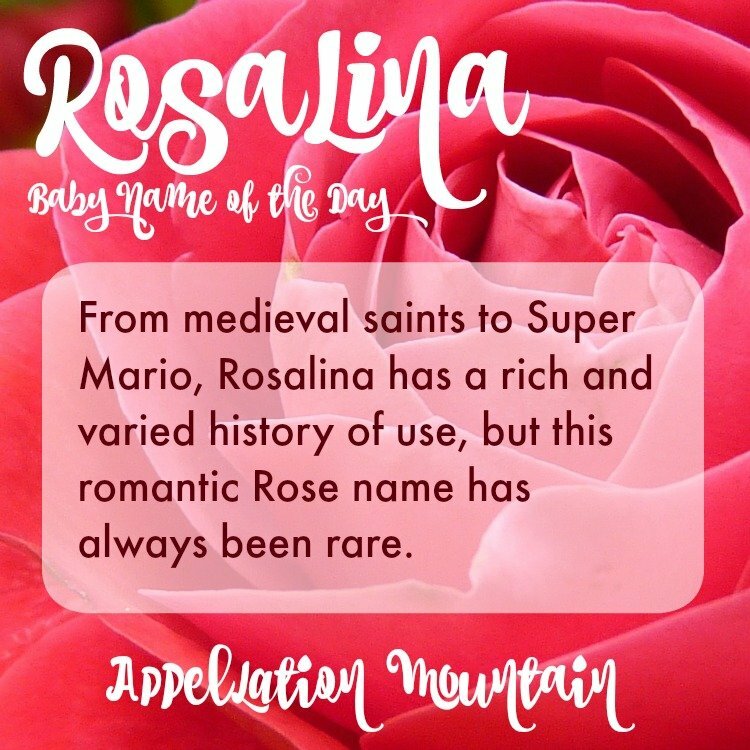 Overall, if you’re looking for a rare Rose name with ties to history and a romantic sound, Rosalina is one to consider. 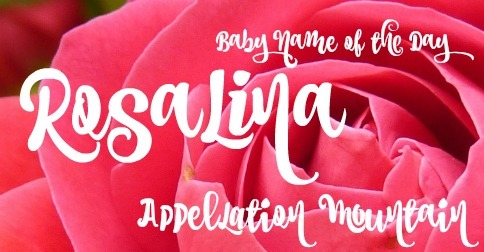 What’s your favorite Rose name? Do you think Rosalina could catch on? Hello what does you mean by riot of roses? As far as I know, it means a lot of roses. The original sense of the word riot meant “an extravagance,” but by the 1300s, it had started to mean “a public disturbance.” So this phrase comes from an earlier meaning of the word. That said, I’m stumped about where the phrase originated, and I’m having trouble finding a reference online. I’ll keep looking! Is it pronounced Rose-uh-lina/leena or Roz-u-line/leena? 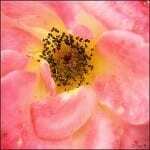 Infinitely prefer the Rose pron.. I would use it if I Knew it would’t be Roz. I love Rose and all the variations but as last name starts with R and is a word name, none are working for me! Hi Caitie, it is pronounced Rose-uh-leena in my italian family. Thanks, Khadija – and I’ve added Khadija to the calendar for February 11th. I’m pretty far ahead on names right now!